Amidst discussions of lost crops and accompanying loss of income, the appearance of a series of boats on the bottom of the Mississippi River in West Memphis during the drought summer of 1988 was a bit of good news. Since the boats were on the Arkansas side of the river, they belonged to the state of Arkansas. The Arkansas Archeological Survey committed to documenting and excavating the remains of eight boats revealed in this low-water event. Survey archeologist Skip Stewart-Abernathy directed the project, and edited a book about it, Ghost Boats on the Mississippi, which can be found in our Publications catalog. 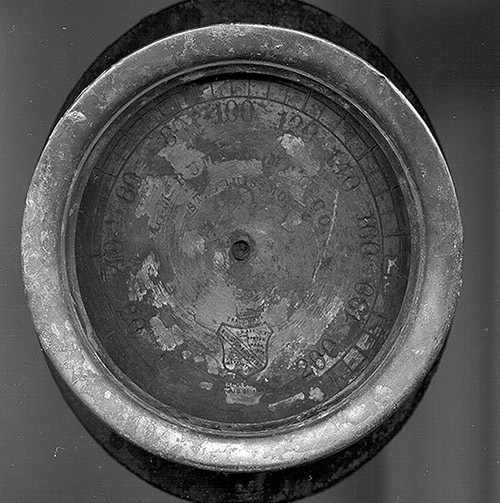 Close-up of the face of the steam gauge. This type of unexpected find and the ensuing excavations are often called “salvage archeology.” With the boatwrecks site, the urgency was not only caused by fear of the water rising, but also the damage done by people digging around the wrecks and taking pieces away. In a salvage project, every effort is made to record and document as much as possible in a short period of time. There were scores of visitors to the site during our work from late June through mid-August 1988. The Mississippi River was 40 feet below the normal top of its riverbanks. This exposed a long segment of sandy beach where the boat remnants lay. The two best preserved boats were a wooden model barge and several sections of a stern-wheel steamboat. Staff from the Arkansas Archeological Survey and trained volunteers from the Arkansas Archeological Society worked to excavate, photograph, and document the unusual finds. The model barge had been constructed from pine lumber, something that is rarely preserved on a terrestrial archeological site. Excavations of part of the steamboat crew cabins revealed wooden framing, a stool, and fabric from window curtains. There were tomato seeds preserved inside a glass ketchup bottle. One of the most exciting finds was a brass steam gauge. It was in very good condition, and the manufacturer’s name was on the dial. It was found in an excavation unit near where the boiler would have been in the wreckage of the steamboat. It is an Ashcroft brand steam pressure gauge, manufactured by the L.M. Munsey manufacturing company of St. Louis, Missouri. Its trademark indicates that it was made according to a patent granted to the E. H. Ashcroft firm of Boston in 1876. An advanced version of the basic gauge design is still produced by Ashcroft today (Ashcroft 2018). Although it was impossible to determine the name of the wrecked steamboat, we know that it sank in the 1920s because of maker’s marks on fire bricks from the boiler room. So the steam gauge was made well after the patent date. It may even have been used first on another steamboat and salvaged to be reused in this boat. After the excavations, the steam gauge was cleaned and conserved by the Memphis Pink Palace Museum staff. 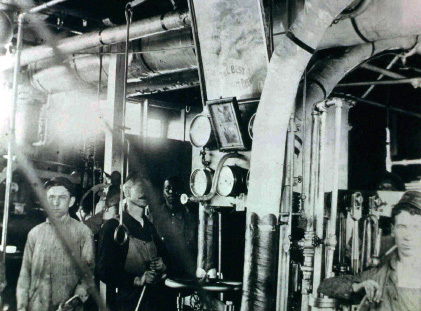 Photo of similar steam gauges in use in an engine room. The steamboat engine works when fuel (coal) is burned and water in the boiler becomes steam. During this process the water increases 1,600 times in volume. The steam is drawn into the crank and flywheel which turn the paddlewheel and propel the boat. The steam engine was a powerful force, and many nineteenth-century steamboats exploded and were destroyed when the water level inside the boiler was allowed to get too low. Steam gauges were essential in monitoring steam pressure for large stern wheelers (Spitzler 2018). I [Kathy Cande] was one of three assistants to Skip Stewart-Abernathy at the beginning of this project. It was a daily adventure just getting to the wrecks each morning. Somehow people figured out how to visit us, traveling in jeeps with 4-wheel drive, ATVs, dune buggies, and even in an ultra-light plane. I was fortunate to be present when the steam gauge was found. That day there was a photographer from National Geographic magazine visiting. He shot what seemed like hundreds of pictures of me holding the gauge, and cleaning it off with water. There was an article in National Geographic in November 1988, but it consisted of only a couple of sentences at the beginning of the magazine with reports about other projects, the photograph of the steam gauge was about the size of a postage stamp, and of course, I am not in it. 2014 History, 1852-1928. Ashcroft, Inc., Stratford, Connecticut. Electronic document, www.ashcroft.com/about_us/history.cfm. Accessed August 16, 2018. 2018 A Short History of Steam Engines and How They Work. Online Steamboat Museum, Engineroom Tour. Electronic document, www.steamboats.com/museum/engineroom.html#tour. Accessed August 13, 2018.